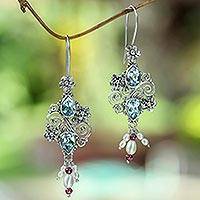 Pearl raindrops fall from blue topaz skies in an elegant fantasy conjured by Buana. Set in luminous sterling silver, the gems become earrings of timeless appeal. Pairing dazzling blue topaz with iridescent pearls, these earrings from Shanker are captivating. 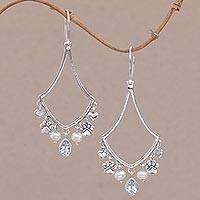 The earrings are crafted with sterling silver and 3 gemstone carats. 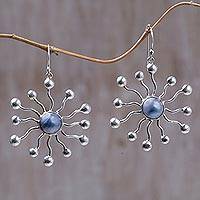 Knotted by hand on silvery strands, gemstones cluster in radiant earrings. Nareerat combines blue calcite with quartz, aquamarine and luminous white pearls. By Rituu, these scintillating earrings feature the shimmer of pearl clusters. Set on silver, they culminate in navy blue chalcedony with subtle facets.